Hi all...I have some exciting news. 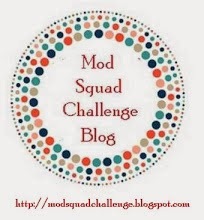 I am Hosting this week's challenge over at the Mod Squad Challenge Blog. Our sponsor this week is the fabulous Sparkle N Sprinkle company. The theme for this week's challenge is All About the Animals. I chose to use one of their fantastic digital image sets called Winter Wonderland. The set comes with an outline version and a pre-colored version. I used the outline version for my card. The card I made is 6" x 6". I printed the image onto white card stock and then colored the image with Copic markers (pine trees - YG63, YG67; deer and bunny - E31, E34, R01; trees - E74, E77; snow - C0; ice - B0000; bird - B02, B04, Y38). After coloring the image, I used a Sakura Clear Star gel pen on the trees, ice and sides of the trees. However, it didn't give me the sparkle and dimension I was looking for, so I went over that with Stickles Frosted Lace Glitter Glue and while it was still wet, sprinkled Dazzling Diamonds Glitter from Stampin' Up! over it. After that dried, I used a brush to remove all the excess loose glitter from the card. I then used Ranger's Glossy Accents to create the "frozen" pond. I layered the image onto Basic Black card stock, then Tempting Turquoise card stock and finally onto a Whisper White card stock base. I printed the sentiment that comes with the set and mounted it on black card and used foam tape to pop it up on the side. Finally, I added a silver snowflake sticker from Class A Peels. This picture was very difficult to take, but let me tell you, the shine and sparkle in real life is amazing looking. I hope you get a chance to join us at the challenge this week. And don't forget to check out our sponsor and see what they have to offer. Lots and lots of very fun crafting supplies. What a beautiful winter scene - gorgeous card. Susan, this is gorgeous! Loving all the sparkle on the snow and your soft coloring is fabulous. :-D Now, time for a DT hat -- I'm really tickled to see you joining our "Anything Goes" challenge at Through the Craft Room Door this week. Good luck and come play again soon, won't you? Beautiful, glittery creation! I love the image set you used! So glad you joined us at House of Cards! Hope to see you back for our next challenge! Winter Wonderland - the perfect title for this stunning winter scene! I love all the sparkly snow on your gorgeous card! Thanks, Susan for joining us at House of Cards. What a gorgeous Winter scene!! I love it!! Thanks for joining us at 7 Kids College Fund! The pretty scene you've created is exactly what it looks like outside my window these days! What a perfectly beautiful card for a cold winter's day! WOW this is stunning Susan! I love that image and all of the sparkle!! Thanks so much for joining us at HOC this month! Way to go Girlfriend for hosting the Mod Squad Challenge. Fabulous card. Love all the sparkle and such an awesome scene. I am sitting here with the AC on trying to cool down. Your scene sure did that lol. Congrats on the gig -- beautiful card! I bet IRL it looks even more amazing! You did a beautiful job on this scene design. I love all the glittery snow. I have always admired that stamp myself so I was glad to see you use it. WOW, this looks great! Love how you picked the blue from the bird for the card base. Great sparkle. What a fabulous scene. Very very pretty. Thanks for joining us at Great Impressions. This is just delightful! It has been a while since I was able to visit you and I am glad I had a chance to stop by today! Your work continues to be beautiful and full of great detail. Thanks for dropping by our house here at 613 Avenue Create. We always enjoy your visits! this is really a beautiful winter scene ..I love all the sparkle on your card ...totally stunning ...thanks for joining us at inky impressions ...good luck ..come back and see us soon..
Wow, what a beautiful scene on your card. Absolutely gorgeous. Thanks for playing along with our Winter Blues challenge at Little Red Wagon. What a wonderful scenery card. That looks like my backyard today. Thanks for sharing with us at The Little Red Wagon's Winter Blues challenge. Wonderful winter card! I love the glitters to show snow in your creations...Fantastic! Thank you for linking your card to our Challenge this week at Word Art Wednesday. I want to share with you God's Word in Isaiah 43:18-19 which tells us, " "Forget the former things; do not dwell on the past. See, I am doing a new thing! Now it springs up; do you not perceive it? I am making a way in the desert and streams in the wasteland." Have a wonderful day filled with the blessings of the Lord Jesus! Susan, thank you for sharing your secret to making such a beautiful card! Gorgeous! Thanks for joining us at the Through The Craft Room Door challenge this week. Thanks for sharing this beautiful card with us here at www7kidscollegefund.com!